If you’re thinking maybe cutting the cord straightening becomes a lot more easier you’re right! But how does a cordless hair straightener actually work in terms of effectiveness and time efficiency let’s have a look at our 5 favorite cordless hair straighteners. A portable hair straightener without a battery pack. The Cornair is a travel-friendly iron. It is small, compact and very portable. It is affordable too. 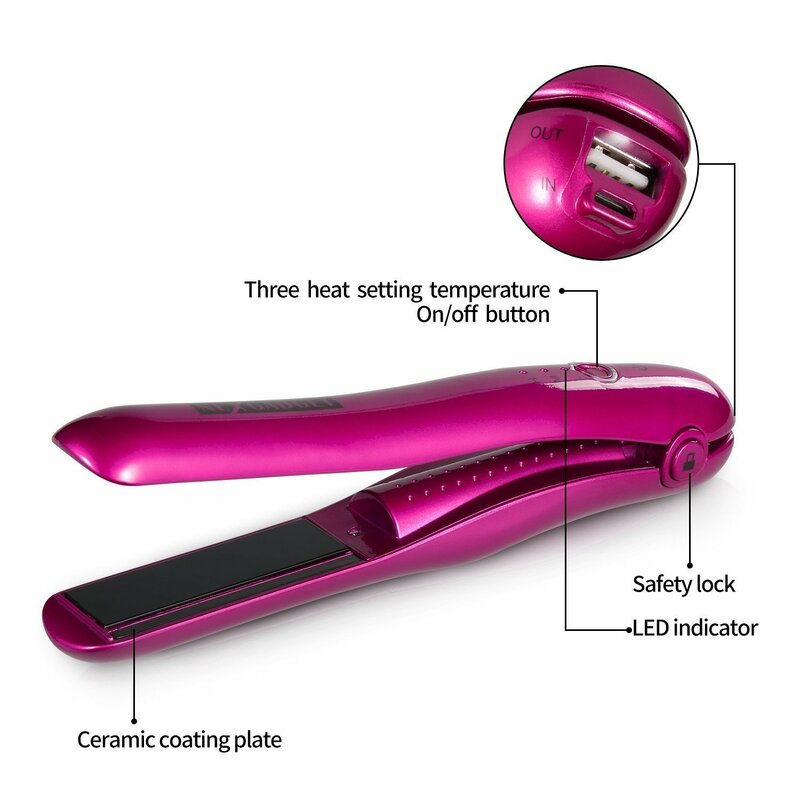 Unlike other cordless flat irons with internal battery, which enables you to recharge them, the Conair comes with thermacell butane gas cartridge that will power the heating. This cartridge you can be refilled when they run out of gas. Depending on how often you use the tool, the gas can last up to several months. You should order a spare of Conair Thermacell, which is sold separately. The Cornair cordless flat iron is comfortable to hold and easy to style. One thing to keep in mind is that if you are traveling on flights, you are allowed to bring just ONE butan iron in carry on or checked baggage. You should also check with your airline carrier for specific requirements, since they may not allow the cartridge in your carry-on bag. Though once you switch it on, you should do something for a while since it takes roughly 2 minutes for plates getting to desired temperature, 419°F. I like its ceramic plates that seems pretty durable (they don’t wear out or break my hair), the quality ¾ inch plates do the job for getting closer to your roots for styling on the go–they can work with smallest sections. Has very fine or freakishly thin hair. Straighten just a part of your hair (probably a strand) that you always want them to be frizz-free. You can re-charge it as as smartphone. A hair straightener that can charge your phone on the go. It can offers 3 level of temperature from 248 to 338 F. This is an average heating for hair tool, and I found it is only suitable for a number of hairtypes, it certainly for slightly hair straightening or curling. It is an item that you only need for your perfect hair style but for your phone when it runs out of battery. Plus, the safe feature will lock the tool when you put in your bag, no accidentally turn on, or in case you just forget to switch it off after use, it will automatically shut off in 30 minutes. Chi always innovates their products, and the CHI Smart Voyager 1″ allow you to style your hair on the go. The include cigarette lighter power adapter lets you charge the tool in car. 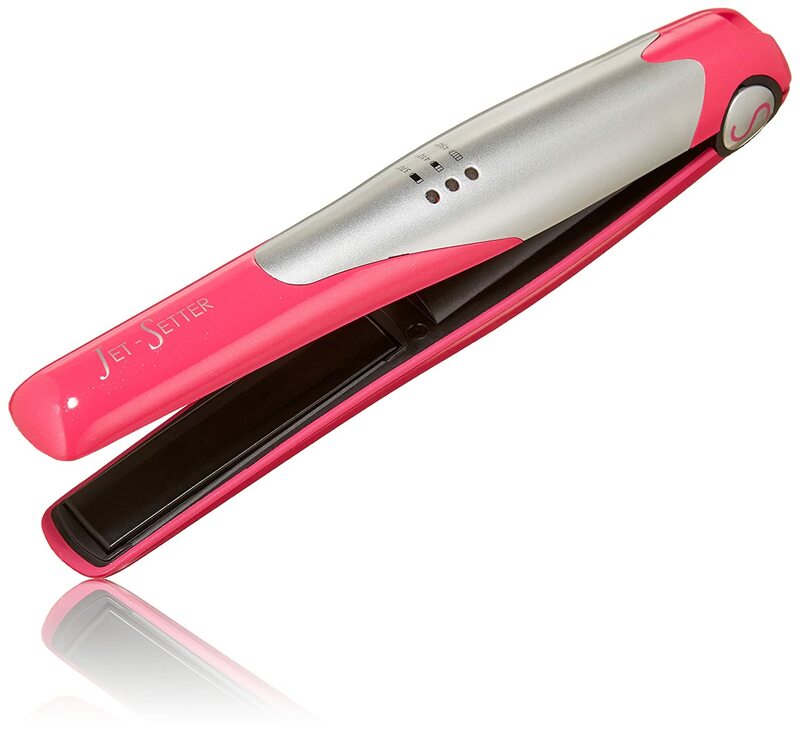 It has rugged and smooth titanium plates, which ensure never breaking your hair when you style. Very convenient for traveling and on the go. This battery operated hair straightener does not get hot enough to flat your hair. It can work in less than 20 minutes. Get salon quality styles on the go with Carmen C81015. The small and compact size of Carmen C81015 doesn’t hold it back from the capacity to straighten your hair smoothly and quickly. Though the plate is narrow, it has the lithium battery, which helps maintain the plates hot for 25 minutes. The Carmen C81015 works ideally on short hair with 3 settings 284, 320, 365F. If you have very thick and stubborn hair and want to go through all sections, my advise is avoid using cordless hair straightener, well, the reason you have to pass a lot of times through sectioned strands since the iron may provide sufficient heat. However, it is fine if you just want to smooth a small strand. Most cordless hair straightener run out of battery quickly. But if you just need a few minutes for your hair, this one would do the job no matter what you straight or curl your hair. BaByliss 2581BU Pro is a ceramic cordless flat iron. It is powered by butane gass, it gets the same problem as Conair cordless flat iron. But all you need is to sort a couple of strands it is fine. One thing you would love about this portable flat iron as I do is that it does get to the heat enough for straighten your hair. Note that the small plate size and a low heat system makes it difficult to work on curly or thick hair. Once they are fully charged, you can use them for up to 30 minutes with lowest heat setting. I found no trouble with the silicon plates, like snagging or breaking hair. If you travel to place where the voltage supply is 240V, don’t worry it is safe. The maximum temperature the surface of plates can get is 450F as they claim, but it happens to be lower that you have to go slowly through sections. Want to curl with this flat iron, indeed, the curved housing design make it very possible for creating beach waves. The problem with most cordless rechargable flat iron is battery, which doesn’t last long and inconsistant temperature on the plates. This makes it difficult for you to finish all sections of your hair. And Chi Escape is not an exception. The lithium battery provide power for the iron around 30 minutes. The Chi Escape is a rugged and ergonomic tool. Well, it is easy to operate this tool since you can adjust the heating level suitable for you hair types. Whether you have fine, medium or coarse, they always have a setting giving you the best results, which you easily notice by colors coded to blue green and red. If you don’t want the battery drain so quickly, choose a lower temperature setting. You can take Chi Cordless everywhere, it works for both votage 220 and 110. Chi claims their iron can last up to 100 minutes, but truly the time for it working best significantly shorter. When you would need a cordless hair straightener? Are cordless hair straightening flat irons suitable for all hair types? Unlike wired variable temperature flat irons, which can heat up the plate to the temperature virtually works on all hair types, cordless flat irons don’t. Being cordless, the hair straightener have to compromise the heating. You shouldn’t buy a cordless flat iron if you have super thick, course, ethnic, or very curly hair, because these flat irons don’t get hot enough so you may have to pass over the same section many times, which is not only annoying but more like to damage your hair. For variable heat setting hair straighteners, if you set higher heating the battery will drain faster. A common thing that most hair tools using internal battery has is their battery after one or two years of use will be dead (it won’t hold a charge), meaning that you can’t re-charge them. So it is time you should replace them with a new one. However, most wireless hair straighteners are pretty cheap, no brainer if you replace them. Another drawback of cordless flat iron is their low heating, each time you slide the flat iron on your hair section, the plate will lose a mount of heat. Most cordless flat iron fail to provide quickly that heat lost to keep the plate’s temperature consistent. In other words, they couldn’t supplement the heat lost. In the future, maybe the better battery will be used to keep the plate temperature more consistent once afther they go through your hair. But for me they are a necessary item when I travel since they are wireless and easy to carry on and help form my hair style every where. I have thin, short hair. I have been loking for a new hair straightener, the cornair seems to be suitable but I am afraid its plate is too hot to my hair, only one setting for Butan hair straightener. The Camen is good, but I am not sure its battery can last until I finish straightening. Any recommendations? I would prefer Cornair flat iron if I have thin and fine hair. You don’t have to recharge it. But because of its low heating, you are expected to wait a little while to go hrough your hair strand agian. Since it takes time for the plate to recover to the highest heat. Looking for a flat iron for camping, I ended up on this post. So as you said the cordless flat iron with butane cartridge is the best for camping because they don’t required charge. I wonder can we take a few butane refill cartridges on the plane. And how many hours the gas can last for straightening? For battery operated flat iron, how long do they last, just a few minutes or up to 10 minutes. @Lindsay J don’t buy battery flat iron and take them with you on your camping trip. @Angelina I think time for straightening is optimized from 3 to 5 minutes, if you set lower temperature they can work longer. For camping I also rather take the flat iron with butane cartridge. These cordless flat irons never work on my thick, long hair. 😀 why they sell hot tools that only work in a few minutes. Supposedly they are used to style a bang to keep it straight. The problem with battery flat iron is the battery itself, with its low capacity, it couldn’t power the plates. Hi, what is battery’s capacity of these flat irons and how long they can hold charge. If the battery capacity is 3000mAh it is just the same as my phone’s battery and powerless for a flat iron.